"We think we will be 100 percent leased on the retail at the end of February," Ebert said. The Christopher residential high-rise will open in March and Tom Thumb plans to debut its store in the spring. Remember when Lucy Billingsley couldn't get Two Arts Plaza off the ground, even after a much smaller redesign? Since then we have seen KPMG Plaza, McKinney & Olive, 1900 Pearl, PwC Tower (Park District) and The Union break ground and fill up. Agreed, the office building developers have been very conservative in Dallas. Almost no significantly spec space being built. I wonder how many companies would choose to relocate to Uptown/Downtown if there was brand new Class A space available immediately. There seems to be plenty in the suburbs. People have been saying that for ages. The ship has sailed. Too many developers in downtown just sit on land waiting to build the next Salesforce tower. But demand is not happening unless it's for "more parkin'". The best we can hope for is more projects like the AMLi. Those projects will make a difference. 100,000 sf lease says a lot. There is room for more, time to build even more! Tnexster wrote: 100,000 sf lease says a lot. There is room for more, time to build even more! Given that SalesForce has been on a leasing spree lately, getting naming rights and/or flagship tenant status on big towers in major cities, is it possible that they only leased as much space as they did so they could be the lead tenant and get the extra visibility? They aren't adding net-new jobs, just consolidating staff from multiple buildings that will now have vacancies of their own to fill. That would be a high spend for not a lot of useful visibility, but then again, tech still loves that kind of meteoric signaling. We will have to see if the new 700,000 square foot tower breaking ground on the riverfront in Austin really is pre-leased by Salesforce, as some rumors have it -- that would be bigger than their new leases in Chicago and Dublin Ireland -- or by next-door neighbor Google (as other rumors have it), which is already going to add office space at Plaza Saltillo transit-oriented development outside downtown to the east. Awesome. I walked by this place this past Saturday (Feb 9th), and it actually looked like people were already dining there, but maybe it was some soft opening, or some friends/family night. Anyway, I had no idea how massive this space was going to be until I walked by, I can't wait until the entire development has wrapped up and it's open. I'm hoping the Union will provide a little, tiny bit of a pedestrian friendly zone for the area. There seems to be a decent amount of density here, but the infrastructure is currently terrible, so hopefully the Union can be the start of some better pedestrian spaces in the area. It also helps that Happiest Hour is just up the street, so perhaps there will be a bit of synergy between the two establishments. In fact, once you're at HH, it's just another short walk to Victory Park which will soon have the upcoming "Dibs on Victory" and "Hero" establishments which both look like they will be quite big/popular too. There's still a ways to go in this area, but this is a pretty good start for sure. 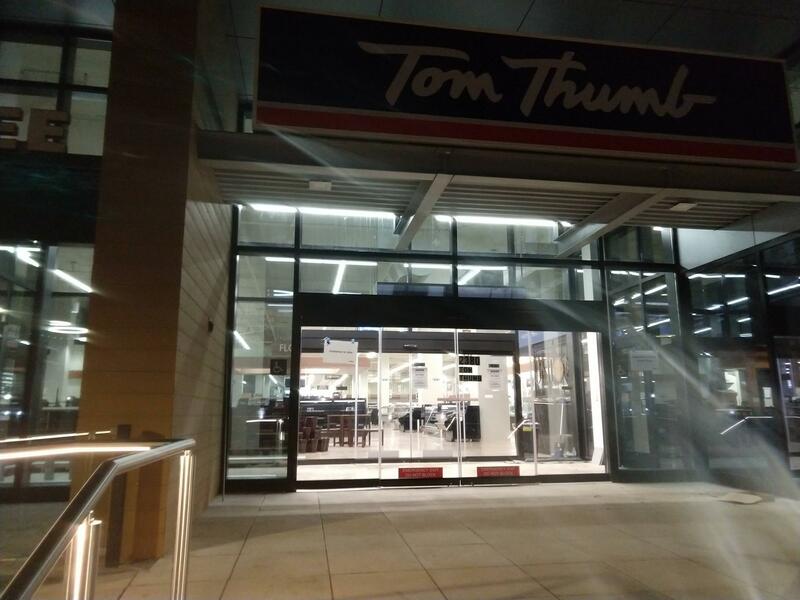 The Tom Thumb has interior fittings and finishes done, but no products yet. I drove by a few weeks ago and then again this weekend, and there was no change. Today's the big day! @thehenryrestaurant is now open for breakfast, lunch and dinner at The Union Dallas. "Not to be too cliché, but one of the reasons why we named it "The Union" was we think the site location and what we built on it will create some type of unity between Victory Park and Uptown that doesn’t really exist from a pedestrian standpoint today. And it’s going to be a union of uses again with office, grocery, restaurants and multi-family all within the same project along with a half-acre park. We have a 25-year history in retail. We really like place-making and believe that really good mixed-use happens at the street level. I think what we were really focused on all along was trying to make sure that, for the visitor or the consumer entering the property, all four sides of it were inviting and friendly." Haven't seen the completed project yet, but I think they absolutely lived up to the "Union" name. I'm glad they understood the importance of connecting with the neighborhood at street level, and I think this development is significant enough to draw a decent amount of foot traffic on its own. Hopefully this will set the bar higher for upcoming developments in the area (unfortunately, a lot of the area is still built out, but there is still opportunity for a few more). he new Union Dallas building at 2300 N. Field St. has lured in some buzzy eateries. That includes the official debut of TacoLingo, the new concept from veteran restaurateur Rich Hicks. Hicks is currently known as the founder of Pie Tap, the upscale pizza chain with locations in the Design District and on Henderson Avenue, which won Best New Restaurant in CultureMap's 2017 Tastemaker Awards. They'll have a more casual atmosphere than the other restaurants at the Union, with great music, late-night hours, tacos, margaritas by the pitcher, and service industry nights. Very surprising addition to The Union. In general, it seems like these brand new developments prefer to stay away from things such as late-night eats, service industry nights, and maragarita pitchers. It seems like the newer developments in Dallas tend to want to provide more of an upscale dining experience, and almost want to 'shoo' away the party scene. Love it. No idea the quality of the place, but sustainable restaurant infill means a mix of places, not just $$$-$$$$ restaurants. Should draw more residents and casual business lunch-goers. I work next to this development and the office is constantly bemoaning the lack of quality QSR options. Finally starting to change a bit. So much of the Uptown restaurant scene is aimed at expense account dining. It’s nice to see a grocery store and some affordable spots for the people who actually live there. That’s what makes a neighborhood livable. Looks like they are getting close, can't wait for this to open. Exciting! Thanks for the pictures! I imagine for Tom Thumb this will be a very important store for them to prove they can compete for urban customers as well as the customer who stays in suburban strip centers for their grocery needs. Keeping in mind this store will serve plenty of office workers who need to get some groceries on the way home to Carrolton, Plano, Frisco etc. I can imagine any number of office workers who instead of sitting on 35 will stop in and shop while they wait for peak traffic to wither away. Personally, I will stay with Kroger cause I live across the street from one that's open till 1 am but CBD residents will welcome the option to Uber over here or to the new Live Oak location instead of Whole Foods. Went to the Union at 6:30pm today, and was told there was over an hour wait. I got lucky and was able to get a table in the upstairs area (which was open seating, but was still packed). I only stayed for a couple drinks and a snack (chicken nachos), but I had a great expeirence while there, and definitely would like to go back for dinner/brunch sometime. Afterwards, I walked around the Union a bit and nabbed a quick picture of the Tom Thumb (see above). For some reason, I thought the plaza area in the middle was going to be bigger than it actually was. It wasn't small, by any means, but they had a smallish patch of grass in the middle, which I felt was a little awkward. Perhaps it's there as a convenience for people with dogs? I felt like the grass area was so small to the point where it would have been better to just make it all concrete and add more seating so people can hang out in the plaza. I'm really excited to see the Union come to completion as I think it'll really be a popular area once all the retail is filled out. I saw the signs for Tom Thumb, North Italia, the Taco place, and there were also signs for a Sushi place which I was not aware of until today. Anyway, just wanted to share my experience. I'm a little floored by how insanely popular The Henry is, considering how Dallas crowds aren't usually in on what just opened. One Saturday afternoon I was late meeting a party there and they decided to move to HH because it was so crowded. Then a second time I tried to get a brunch table before 11 and the wait was already 30-45 minutes. I would've waited but, since we had a 2-year-old with us, we decided to go to Mesero. I'm looking forward to going back once the newness wears off a little and maybe some of the other retail spaces fill up. lakewoodhobo wrote: I'm a little floored by how insanely popular The Henry is, considering how Dallas crowds aren't usually in on what just opened. That's a good point. Perhaps it's the fact that this place is so massive and noticeable, that people who work/live near the area can't really help but notice it. Plenty of people who work in the immediate area, and there aren't a ton of food options available. I'm sure once the other restaurants start opening at The Union, it'll start evening out the crowds a little bit. "The Henry restaurant has been open for the past six weeks or so, and there are several other restaurants that should be opening in the coming weeks," Bakewell said. "The opening of the Tom Thumb probably has the highest anticipation, and it is scheduled for an April 5 opening date." Yes, I've walked by this development a few times. It looks like only the Henry is open at the moment, but it's already a huge hit. It's going to be bustling once Tom Thumb, the Taco place, and the Sushi place open up. Looks like there was at least one more retail space that was available for lease as well.